Kevin has performed around the world, produced 4 albums of original music, recorded and performed with Jesse Cook, the Sultans of String, Amanda Martinez and others, and had his music used in network TV programs. Kevin grew up in an environment filled with music. Many family members played an instrument or two, and family gatherings often included some kind of impromptu jam session. His mother played accordion and taught at the Ontario Conservatory. Kevin’s music training began at the age of 8, when he took lessons on the banjo-ukulele with local music teacher, Ruth McCallum, who fostered his love of music at an early age by stressing fun and expression, rather than technique and memorization. A year later, he began playing the tenor banjo when his grandfather Denis Laliberté, a self-taught musician who appeared on radio broadcasts in the Windsor, Ontario area in the 1930’s and 1940’s, gave him his vintage S.S. Stewart Wondertone tenor banjo. The banjo eventually led him to the guitar, and soon his grandmother Idella Andrews bought him his first electric guitar. Like many Canadian teenagers in the 1980’s, Kevin played guitar in various high school rock bands, and continued his musical studies, now with Stratford guitarist and teacher Earl Filsinger. A chance purchase of a Pat Metheny record opened his ears to the sound of jazz, and set a new direction for Kevin’s musical pursuits. In 1985, while studying towards a degree in electrical engineering, he began jazz harmony and composition study with Toronto guitarist James Pett. Inspired, he was soon attending jazz workshops led by legendary bebop pianist Barry Harris, leading to an appearance in an instructional video of Harris’ unique approach to jazz harmony. 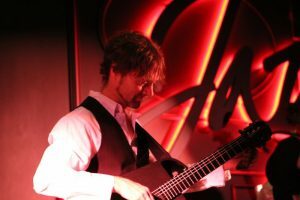 Throughout the 1990’s Kevin performed with various jazz musicians both in Vancouver and Toronto, and played in numerous clubs, often as part of a guitar/saxophone duo with saxophonist Peter Smith, and also backing up a variety of jazz vocalists and singer-songwriters, such as Jackie Johnson, Marion Law, and Pam Reynolds. In 1995, searching for a new sound, Kevin picked up his first nylon-string guitar. This would become a momentous turning point in his musical life. He was inspired by the beauty and challenge of the instrument. Kevin discovered a passion for the music of Spain, and explored ways of integrating this music into his own developing sound. In 1997 he met Canadian flamenco guitarist Roger Scannura, and began a two-year collaboration with him and his dance company, Ritmo Flamenco. Together, they recorded two CDs of original music – “Saracen” and “Medina” – and toured throughout Ontario, playing festivals and concerts. In 1999, Kevin was invited by EMI recording artist/guitarist Jesse Cook to join his band. Touring internationally with Jesse from 1999 to 2004 afforded Kevin the opportunity to tour twice with Irish superstars the Chieftains, perform in concert and on the Tonight Show with Charlotte Church, and perform in Beijing with Chinese recording artist Dadawa. During this period of his career, Kevin also began a concentrated exploration of his own musical voice, turning his attention to composition. The result is the album “Elation”, an independently produced compact disc which represents a meeting of many aspects of Kevin’s experience as a guitarist. “Elation” melds flamenco rhythms, a jazz improvisational approach, and a pop melodic sensibility. In 2005, Kevin’s CD “Elation” was licensed by Somerset Entertainment, and packaged as part of a 2-disc set called “Spanish Café”. Sales in Canada surpassed 10,000 units in just 4 months. In October of 2005, Kevin completed a recording of original guitar music for Somerset Entertainment, entitled “Siesta”. This album is currently distributed internationally on the Avalon label. Around this time he also began a musical partnership with Chris McKhool, co-founding the band Sultans of String with a mandate to explore the fusions and intersections of various styles of instrumental music, from rumba flamenca to middle eastern to gypsy jazz to Celtic music and styles from the subcontinent. The award-winning Sultans of String now have 5 CDs under their belt and tour internationally. Since 2002, Kevin has also continued a collaboration with Latin vocalist Amanda Martinez, recording 3 albums, co-writing and touring with her across Canada, Mexico and as far abroad as South Africa. While keeping busy with the Sultans of String, Amanda Martinez and other projects, Kevin has managed to release “Sundance” (2008) and “ONE” (2013), two more collections of original instrumental music. Kevin is busy these days writing, recording and touring internationally with the Sultans of String and with Amanda Martinez. He also performs regularly in the Toronto area with vocalists Melissa Boyce, Rebecca Binnendyk, Julie Michels and others.